Don't you just love Halloween!? It truly is such a fun time of year- giving kids young and old the chance to let out their inner fan and show the world what they love. We can dress as all of our favorites- our favorite monsters, our favorite celebrities, our favorite television or movie characters, our favorite superheros. There are so many favorites to choose from! This year in our house it is all about our favorite BOOKS!! The Cat in The Hat. What kid doesn't love this childhood classic? Dr Seuss hats can often be found at Halloween or party stores. Then simply dress in black, grab a red bow tie, and paint on some whiskers. Super easy and so much fun! Waldo. I loved the Where's Waldo books as a kid, and this costume couldn't be any easier to pull off. A red and white striped shirt, jeans and stocking cap are all you need. Can't find a shirt? Pick up a white tee, painting tape and red paint and create one of your own! Miss Frizzle. Everyone wants to ride on the Magic Schoolbus! Take a plain blue/black dress, attach some planets, stars or other fun science items, frizz up your hair and have a BLAST! Captain Underpants. Ah, the favorite of little boys everywhere. Go with some black/red/flesh colored under shirt and leggings/pants, top with some white underwear and throw on a red cape! Easy peasy... and sure to get a laugh! The Man in the Yellow Hat. Every monkey's best friend! Find an inexpensive safari hat and spray paint it yellow, and dress in yellow from head to toe! Carry a plush monkey, or have a friend/sibling go as George! The Cheese Touch. Speaking of Wimpy Kid, every fan knows the cheese touch. Create a simple sandwich board and color to look like stinky, molded cheese! Gross! Dobby. No book costume list is complete without Harry Potter! You might think that this would be a tough one to pull off, but cut a head and arm holes out of a pillowcase and create an elf ears headband using construction paper and you are ALL set! The Mouse with a Cookie. This childhood favorite is a classic! Dress your little one all in grey, create some mouse ears from construction paper, draw on some whiskers, and create a construction paper cookie! Adorable! 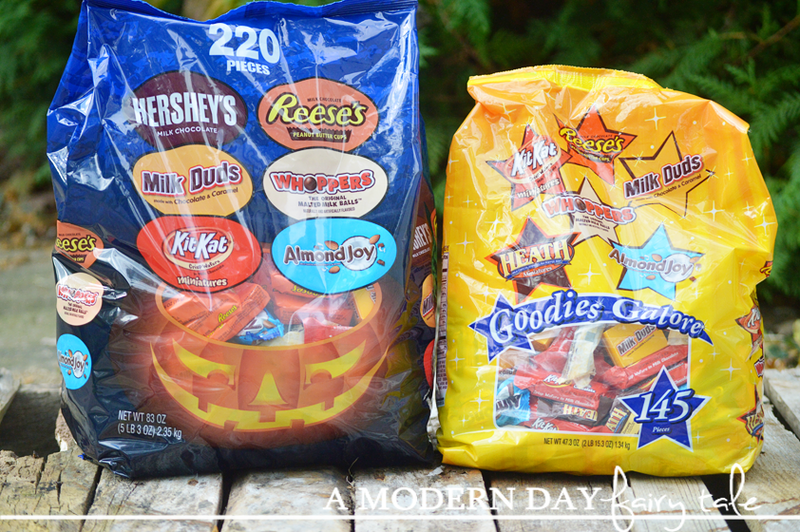 Now that the costume is taken care of, no Halloween festivities would be complete without your favorite candy! I'm going to be honest, I'm a little bit of a candy snob... I'm always on the lookout for the house that has the GOOD candy. You know what I mean, right? Don't we all do that!? Not only do I want to go to the houses with the good candy, I want to BE the house with the good candy! So, while we were at our local Walmart searching for craft supplies for our DIY costumes we stopped by the candy section to see what we could find! 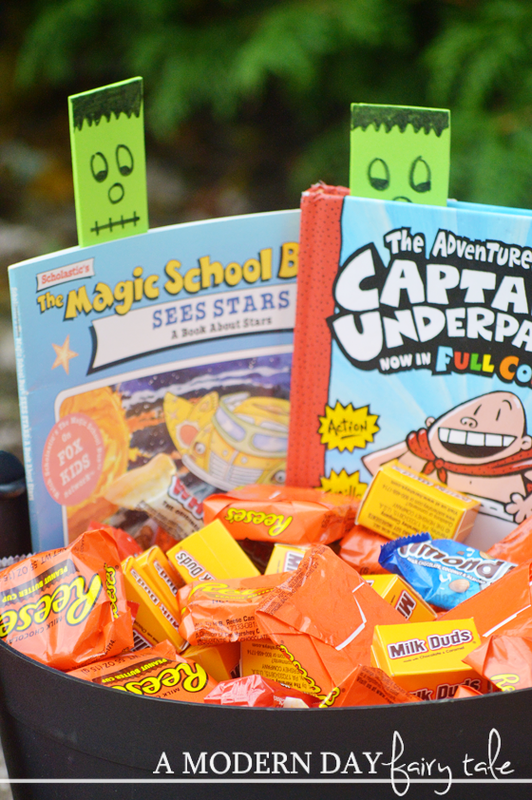 No matter what your Halloween plans, Hershey's Halloween packs are the ideal choice! These fun packs give a variety of all of our personal favorites! For myself, it's all about the Reese's and Almond Joy. My son loves the simplicity of a plain ol' Hershey's Bar. My husband loves his Whoppers, Kit-Kat and Twizzlers. These Halloween packs have a little bit of all of our favorites! And they are the perfect size for all of our Halloween festivities! I can send some to school with my son for class parties, sneak a few before the big day AND still have plenty left over for trick-or-treaters... because there is nothing worse than running out of candy before the night is done!! The kids will be dying to come back to our house for all the great treats... and we'll have plenty to share! 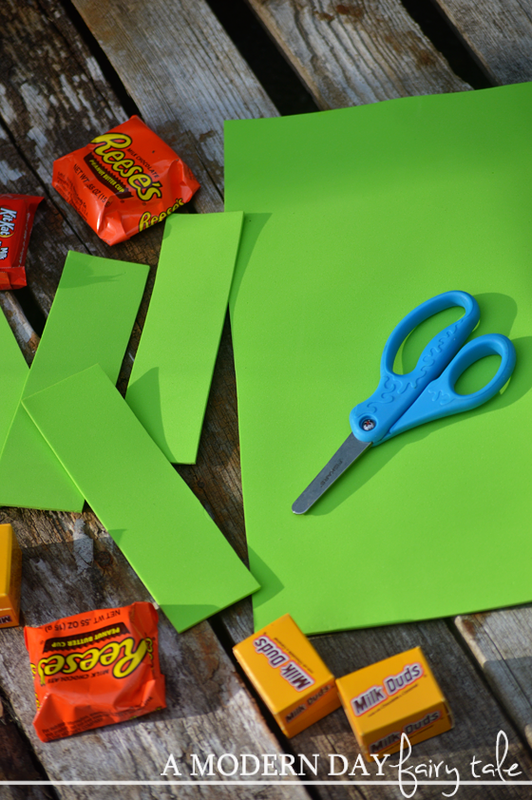 These Hershey's goodies are the perfect Halloween treat all by themselves, but to make it even MORE fun and keep with our book theme, we decided to take our Halloween treats to the next level with some easy DIY Frankenstein Bookmarks! 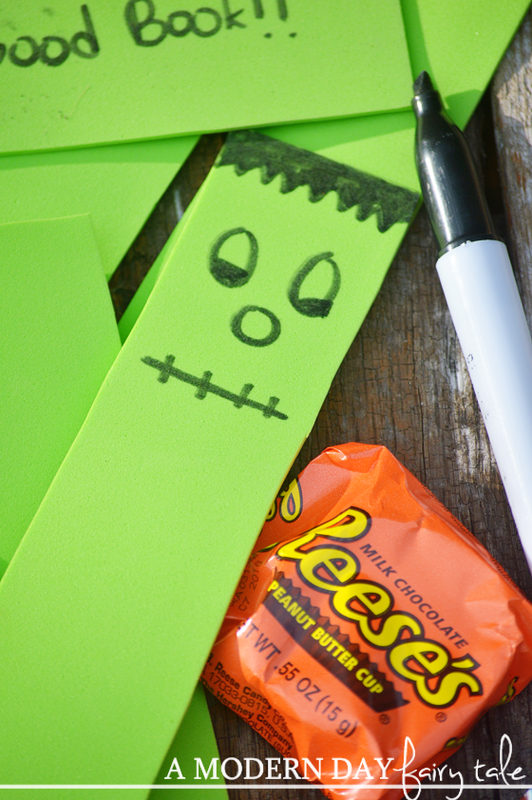 Using the Sharpie, draw a fun Frankenstein face onto the bookmark. On the other side, write a fun message like "Scare Up a Good Book", "Reading is a Treat" or merely a simple "Happy Halloween". Cut a small hole and add some ribbon, if desired. 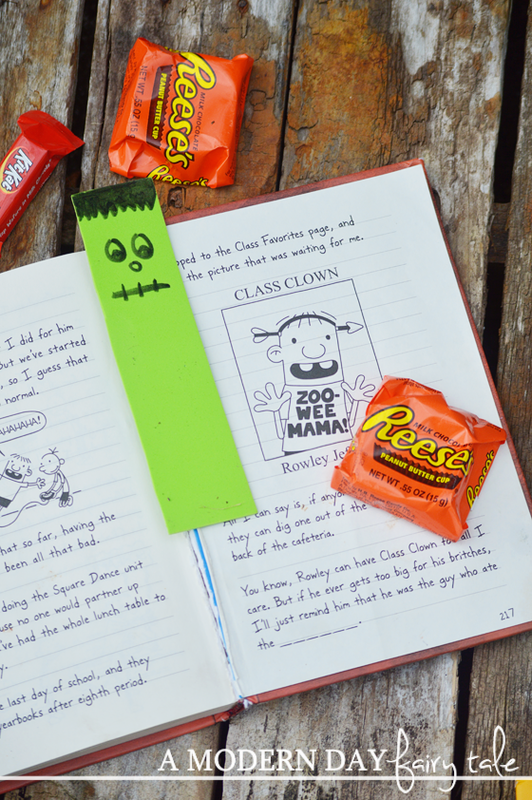 Toss these fun bookmarks into your treat bags, and you are SET! 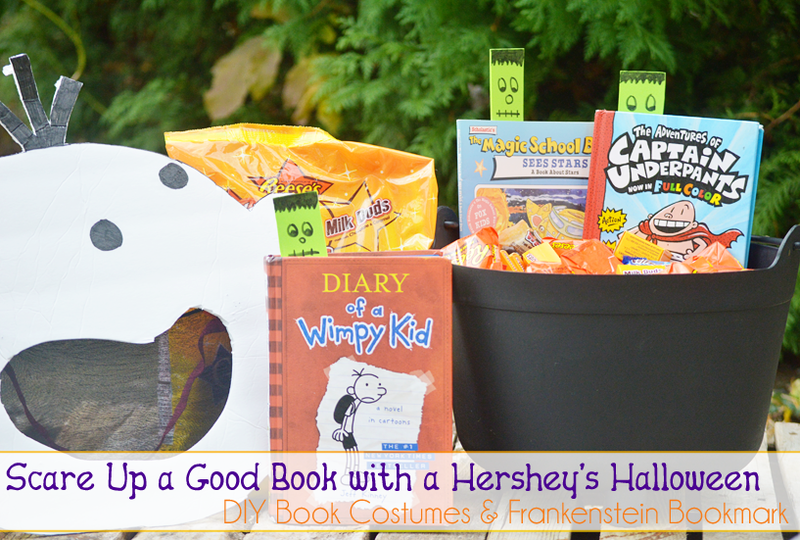 With DIY Book Costumes and Hershey's treats, this is just to be one Booktastic Halloween that your little ones will not soon forget! 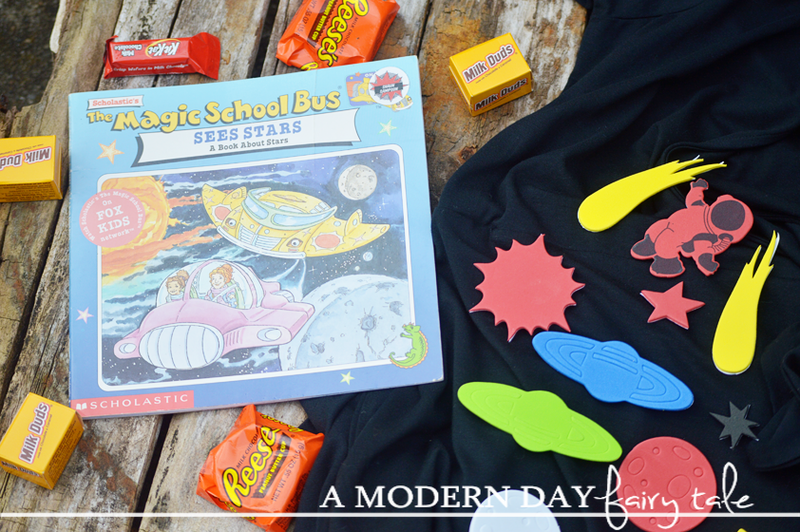 Are you celebrating your favorite book characters for Halloween this year? What other fun character costume ideas do YOU have? How can Hershey's take your Halloween to the next level? 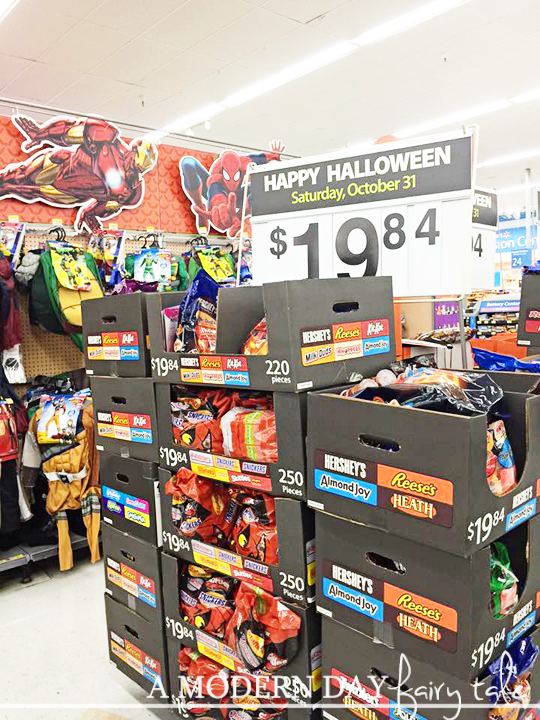 Be sure to check out more Hershey’s Halloween Candy at Walmart! So fun!! I love your son's costume! I went easy this year since my son has no opinion so he is going to be Charlie Brown :) Love these bookmarks!! 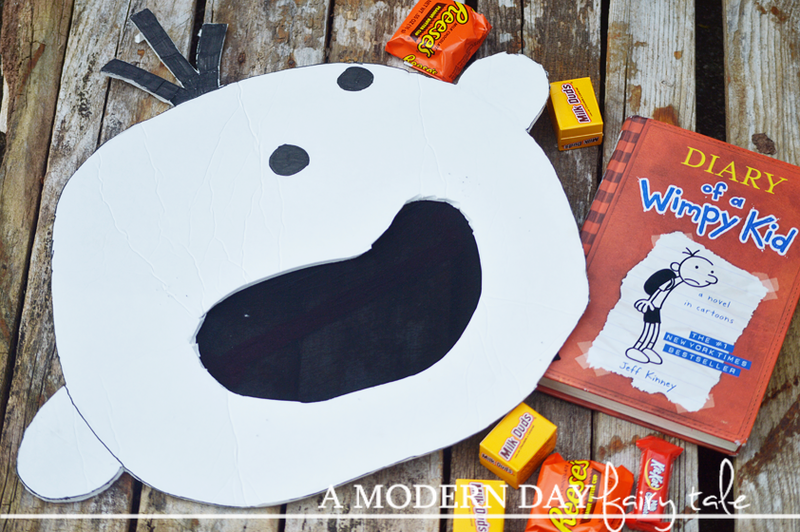 What a fun and easy Halloween craft!! Thanks for sharing!